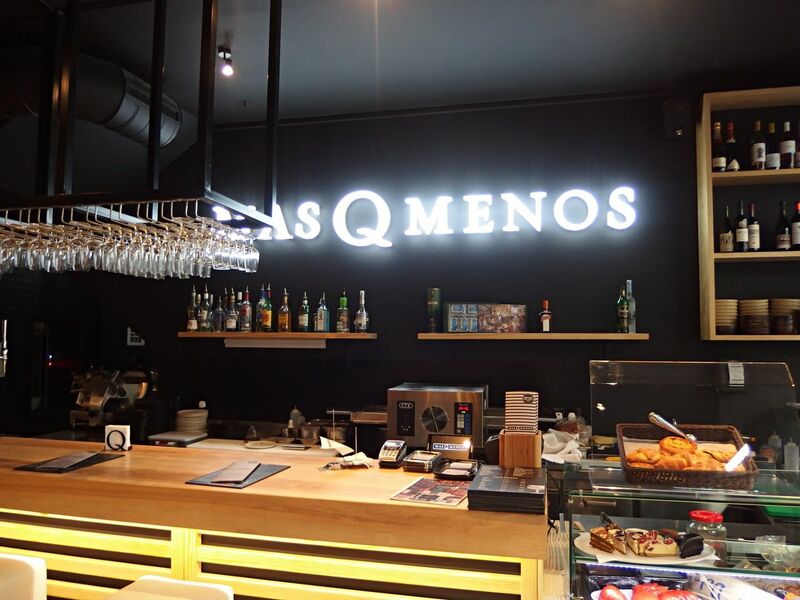 Last month Mas Q Menos opened its doors at a new location right bang in the middle of Soho. Mas Q Menos is a Jamon and Wine bar but offers so much more than that, offering patisserie breakfasts, lunches, cocktails to a whole selection of tapas and an extensive wine list. 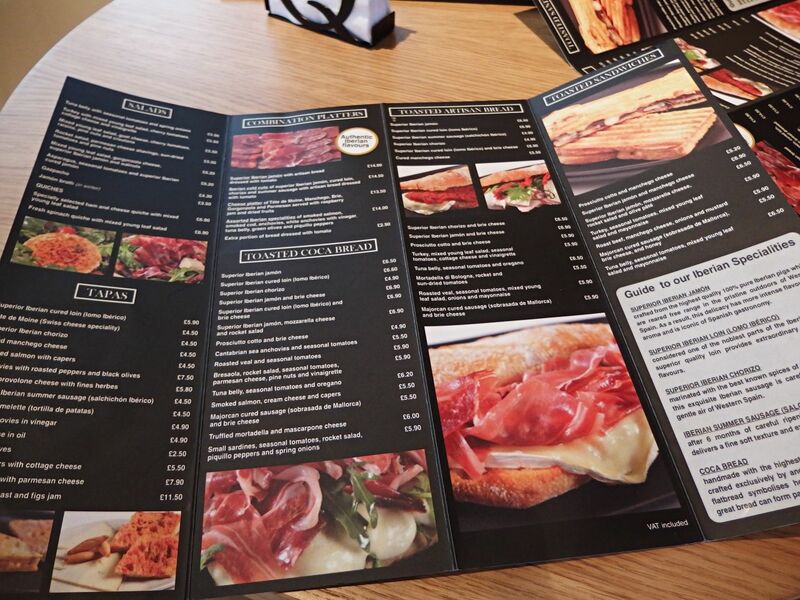 The family run restaurant focuses on the quality and authenticity of the ingredients to bring Spain to you. 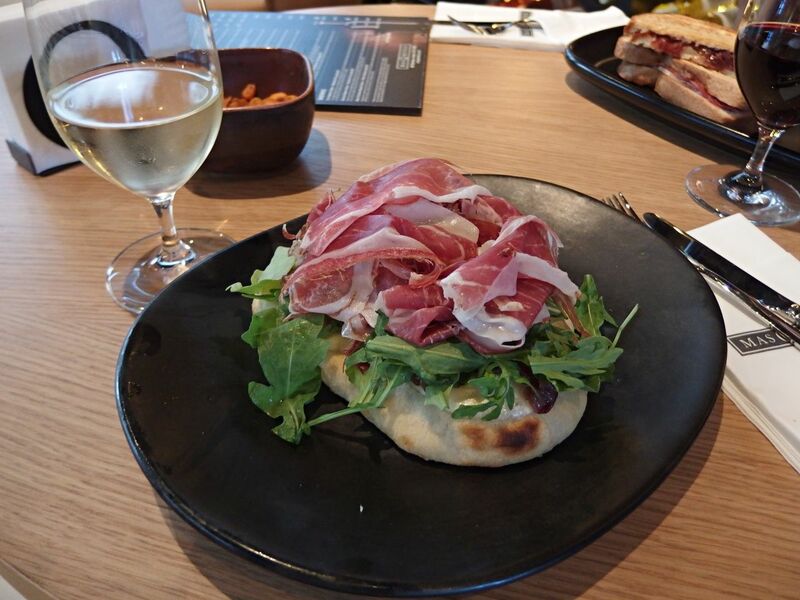 When I was in Barcelona this year, where they also have restaurants, I was addicted to Iberica ham so I couldn’t wait to try them out. Danny and I escaped the busy Soho and popped into Mas Q Menos for a well-earned relaxing lunch. 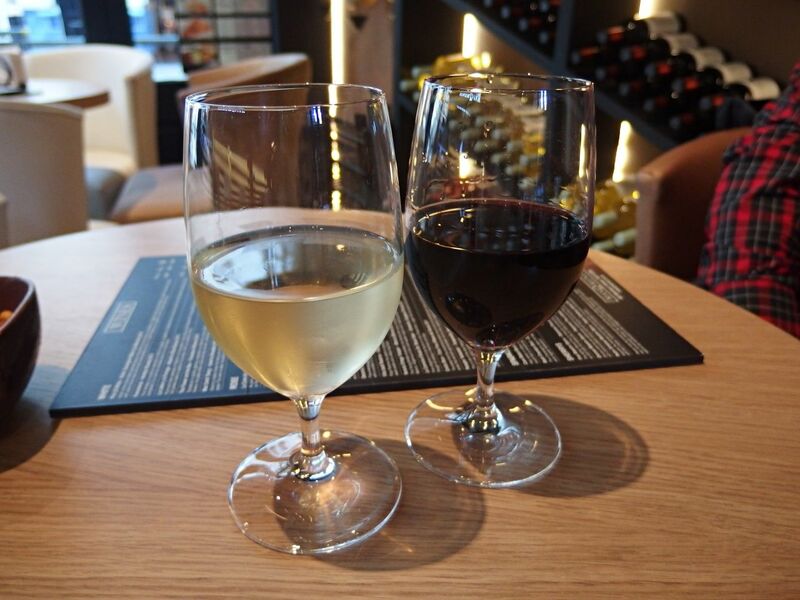 We started off with a glass of wine, I had the ‘Plot 22 White – Airén, Sauvignon Blanc (La Mancha) 2013’ which at only £4.90 for a small glass I thought was rather a bargain and tasted delicious. 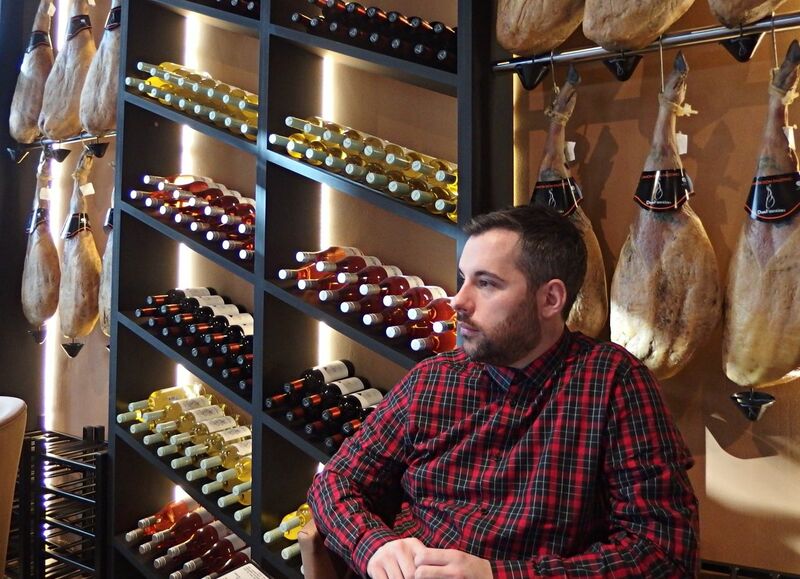 Danny went for a red and chose the ‘Viña Izadi Reserva – Tempranillo (Rioja) 2009’. I am not a lover of red wine but this was my first time trying a Rioja and I think I could be converted! There was so much choice on the menu I really couldn’t decide. 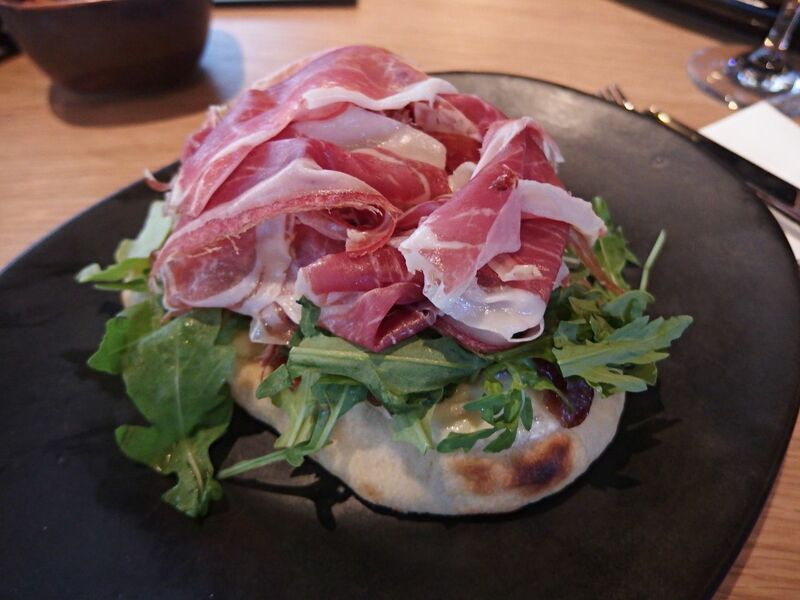 The manager recommended the toasted coca bread so I decided to have that with Iberian Jamon, mozzarella and rocket. When it came out I got a little bit excited, the ham was absolutely perfect and tasted so nice. Mixed with the rocket and mozzarella it was perfect and the coca bread is one not to be missed, very filling and just delicious! 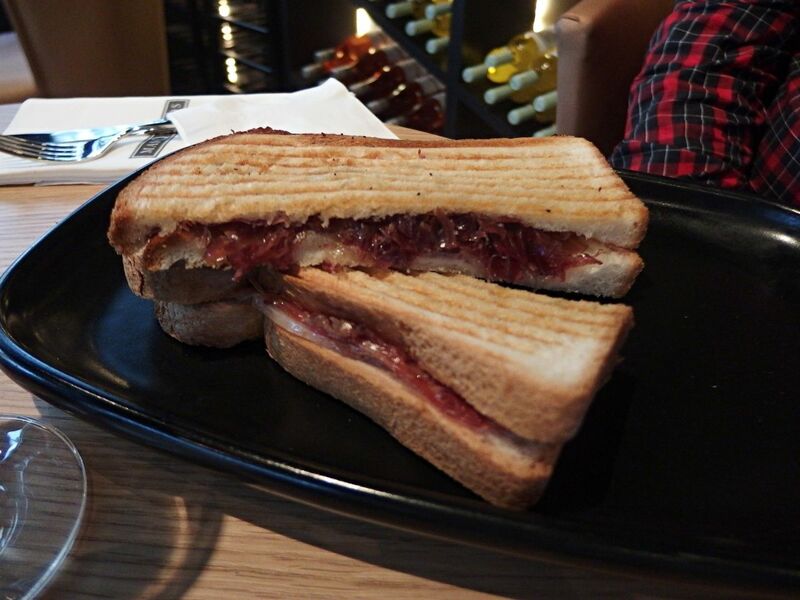 Danny opted for one of the toasted sandwiches with Iberian Jamon and manchego cheese, fair to say he was a bit jealous of what I had went for but said it was really lovely. 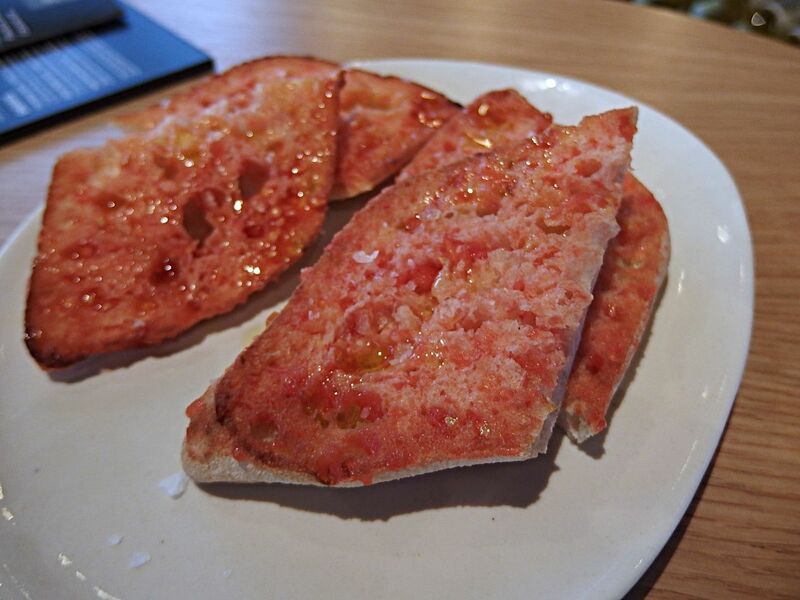 Tomato bread is another firm favourite of mine, so I couldn’t resist ordering some, covered in tomato and that little bit of salt made it absolute perfection. 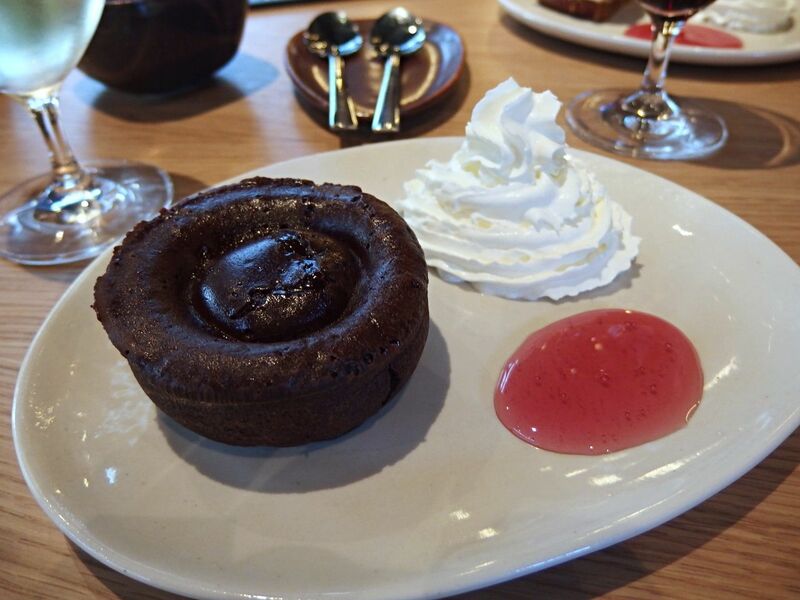 As we were having a bit of a long lunch it was only fair we tried out the puddings! 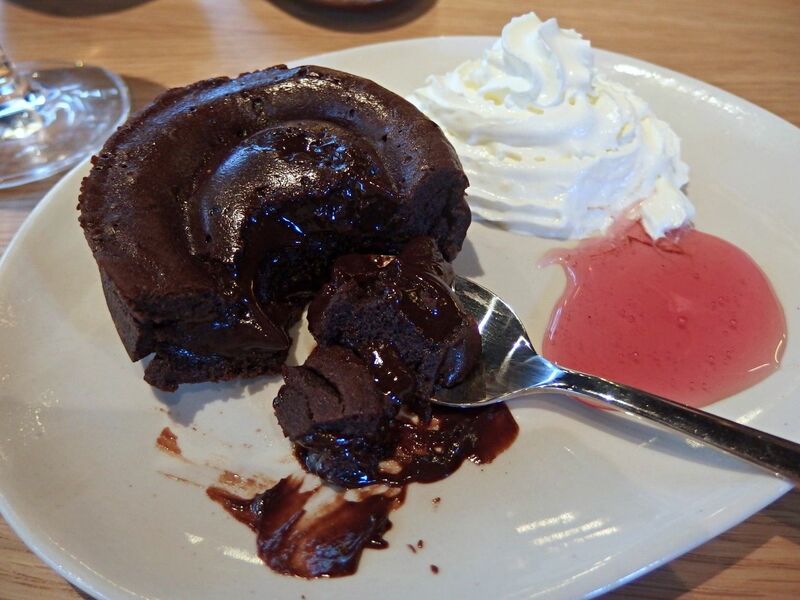 I had the chocolate coulant, which was chocolate pudding oozing with chocolate sauce from the middle, whipped cream and raspberry coulis. 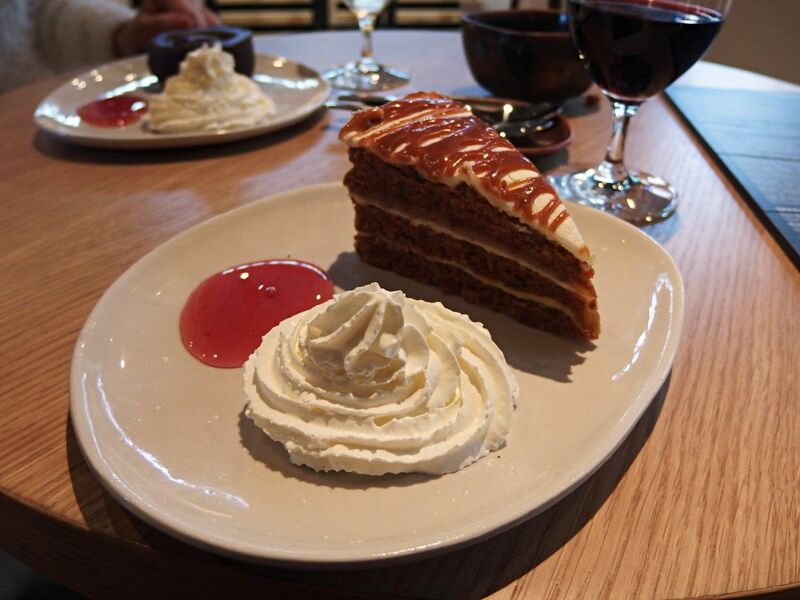 The caramel carrot cake came with the same and was just as good. We finished off with another glass of wine and a sigh that we had to leave! 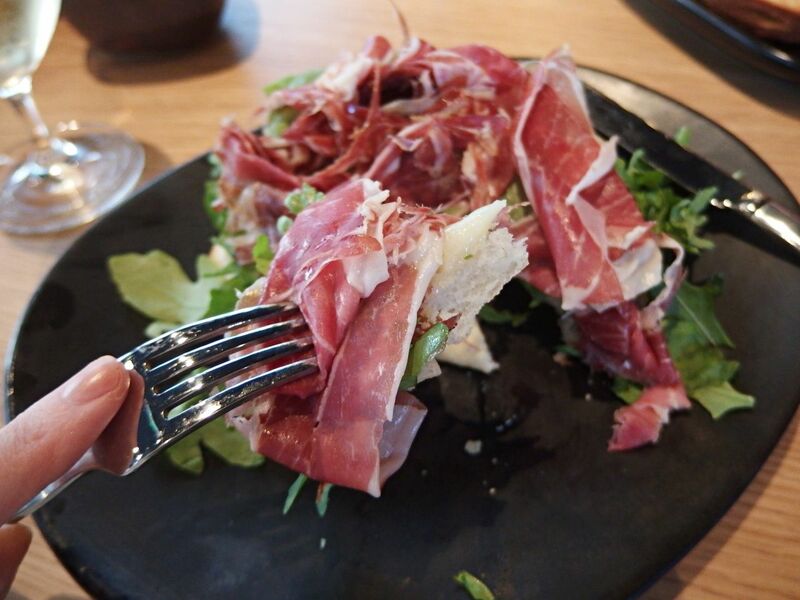 I will definitely be going back to Mas Q Menos, their food is extremely good quality, has an authentic Spanish touch and well I’m just a massive ham fan, without sounding like a total freak! Check out the menu and more details at masqmenos.co.uk.